I know I have been slipping in my reportage on here lately, moving along at roughly a monthly pace…but I have certainly been active around town, and I am deeply appreciative of the many opportunities to be involved with life here. I had a chance to share a piece I wrote about the earthquake at a relief benefit, and I will soon be joining the efforts in Canoa where all proceeds from the benefit were directed. There is no shortage of places to help here…as the rebuilding on the coast will be going for years to come. 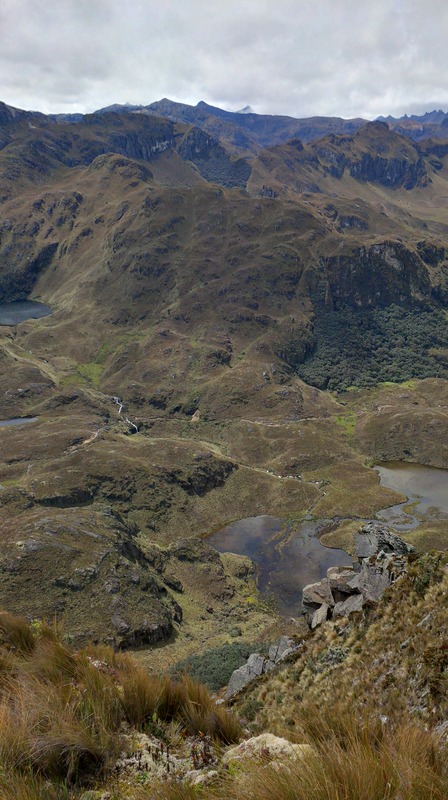 Realizing I would be leaving town so soon, I finally got up to Cajas National Park, a short busride from Cuenca, and enjoyed an incredible day with my dear friend, Sol. She has been in town since mid-May and has been finding various opportunities to teach yoga, share singing workshops and perform her great music live in concert. Anyone who comes to Cuenca would surely be grateful to spend a day up in these amazing mountains. Cajas truly blew us away. Another popular attraction around Cuenca is the thermal spas – Los Baños. A meditation client who has become a friend invited me to join him to the swanky thermal spa where he has a membership. It was an incredible morning. The skies were blue and we spent hours pampering ourselves in the saunas, Turkish steam room, mud pools, naturally hot and cold baths, among other amenities. It was amazing. I hear that internet is scarce where I am headed, so I will likely be offline for a while, but I will share a full report of life on the coast when I am back online.